Peel onions, garlic and ginger and dice finely. Heat clarified butter in a saucepan. Fry the onions, garlic and ginger in it. Add tomato paste and stir. Sprinkle with maple syrup and caramelize briefly while stirring. Douse with vinegar, ketchup and balsamic vinegar and bring to a boil. Cook over medium heat for about 15 minutes. Season with smoked salt. Brush marinade on the spareribs, vacuum in vacuum bag, and refrigerate overnight. Cook for 20 hours at 66 °C in the fusionchef sous vide water bath. Put on the grill on high heat and sauté from each side for about 3 minutes until roasted aromas are formed. 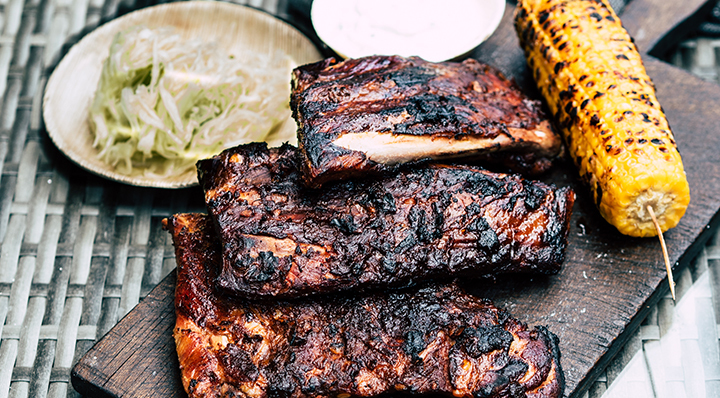 Serve spareribs with a tzatziki dip, grilled corn on the cob, and a white cabbage salad. This recipe was kindly provided by Jens Glatz.